1. Using old styling tools – clean between each use to remove and prevent build up and germs! 2. Using rough elastics - using elastic that is covered in fabric (like a scrunchie) will prevent snagging! 3. Infusing hair with too many chemicals - a chemical overdose can cause breakage and damage. Tr y a pre-treatment before your next visit to the salon! 4. Setting the heat too high - don’t turn the dial above medium! 5. Skipping heat protectant - this is important to help seal in and maintain moisture to keep your hair shafts healthy! 6. Going too long between haircuts - snip the split ends before they take over! The only thing that makes them go away is a trim! 7. Brushing from the roots down - prevent snagging and breakage by working out knots from the bottom up! 8. Handling wet hair roughly - wet hair is more fragile — be careful while combing! 9. 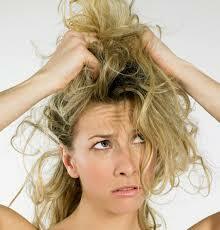 Slathering on too many products - build up is NEVER good and can block hair from soaking up natural moisture. 10. Keeping the same shampoo for changing hair - as your hair changes, so should your shampoo! ← Question of The Day: What Size Flat Iron is Best For Long Hair?